Why install real terrazzo tile or even buy an expensive terrazzo wallpaper when you can easily stencil your own trendy terrazzo look using our cool Terrazzo Stencil! You can stencil this terrazzo design on a kitchen backsplash, update some old furniture or use it for various stenciling craft projects. Also you can stencil it in one color for a uniform effect, or do a multi-color look that resembles a real terazzo material. What's great is that you can select various colors from your own interior and mix and match them all in your terrazzo stencil pattern! Use mini stencil rollers or stencil brushes for this effect. Terrazzo has been popular for a while now and our stencil is right on trend. 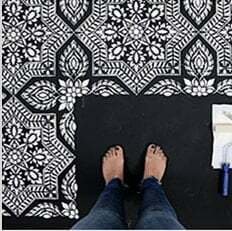 Consider using a stencil for wall painting project instead of purchasing costly and difficult to install (and remove!) wallpaper. Stenciling is an easy painting technique that doesn’t require any artistic ability. As long as you can hold a brush or a roller, you’re pretty much good to stencil a wall! We also offer this mod Terrazzo pattern as a large stencil, for painting your walls and custome curtains. Please check out our Terrazzo Wall stencil! For stencil repeat instructions please refer to the step-by step photos above. This terrazzo wall stencil features an easy registration system, just use parts of the previously painted design to align the stencil, check for level and continue. This gives you a seamless "wallpaper" look. Don't worry about super perfect alignment: in the end your eye will never notice the discrepancy. Our large stencils are expertly designed by professional decorative artists, so stenciling a wall with Cutting Edge Stencils is easy and intuitive. Please make sure you watch our instructional stencil Video Tutorials! You'll find them extremely helpful for your stenciling project. Even beginners get great results! Our wall stencils are expertly crafted in USA using most modern manufacturing methods and highest industry standards.